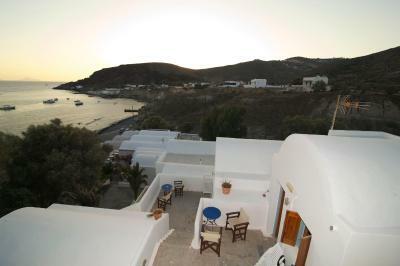 Lock in a great price for Akrotiri Hotel – rated 8.9 by recent guests! A quiet place, next to the bus stop. One of the best restaurants in walking distance. The hotel has its own access to the beach. Operates as a family business. The owner fluently speaks English. Very friendly atmosphere. 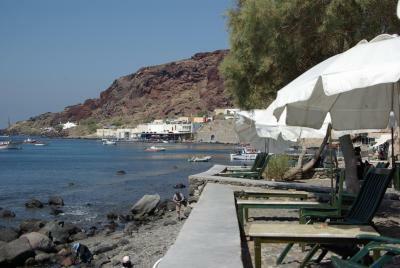 We loved the location...close to Red Beach and away from all the hustle of the busier towns on the islands. The staff was very nice. The shower had consistent water pressure and hot water. Loved the location (on the beach) and the laid back atmosphere. 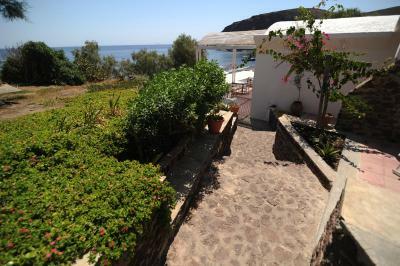 Right on the beach!sich a romantic location and view! This was an incredible find. 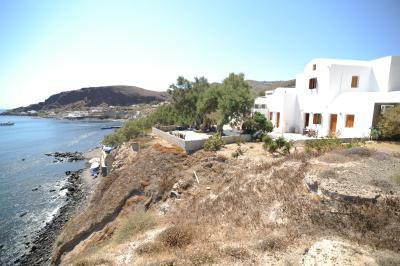 We could walk right down to the beach and it was behind the ancient site. This is a budget-priced property with excellent value! 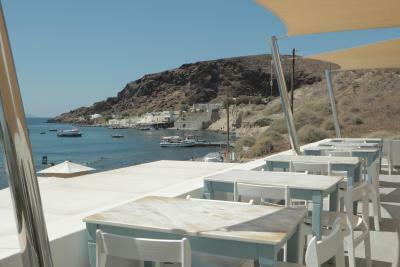 We were looking for a place with free parking (as we arrived by ferry with a car), good breakfast, and economy priced. We also preferred a place away from the noise and chaos. 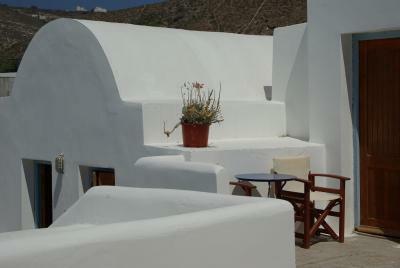 The Akrotiri Hotel fit all these requirements and more. 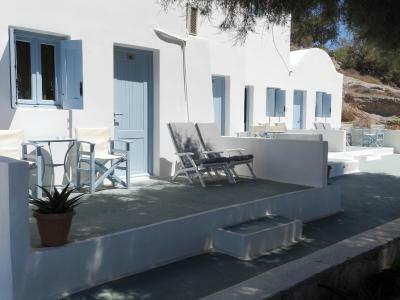 It is right on the water on the south shore of the island, easy walking distance (5 mins) from both the ancient Akrotiri excavations (you shouldn't miss that) and the Red Beach. We arrived earlier than expected, and the staff was nonetheless very helpful and accommodating. 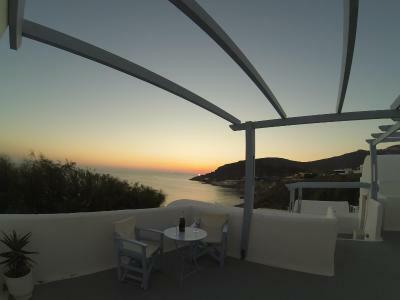 All rooms have a sea-view (see my pics) and sitting areas out front. Ours (I presume all) had a hot plate and small refrigerator. Breakfast is excellent with a slight variety (judging from the two days we stayed). 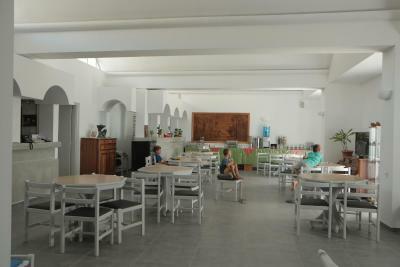 The hotel also runs a coffee/snack bar at the parking area, which is at the end of the road at the sea. Prices there are very reasonable. 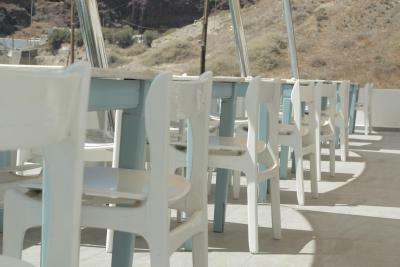 Great location, view, amenities, restaurants, away from the bustle of Fira, but only a bus ride away. 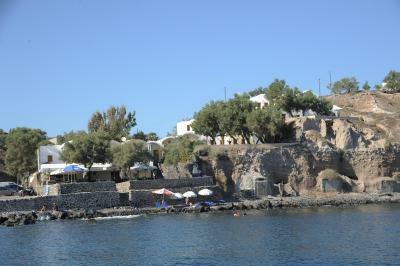 The Akrotiri hotel is uniquely situated, clinging to the hill at the side of the sea. 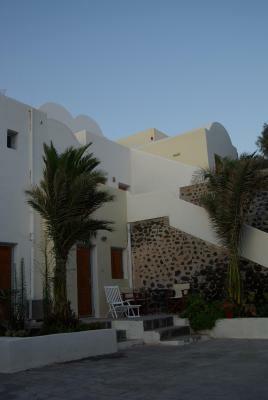 All rooms are separate buildings which are accessed via footpath (steps) from reception. 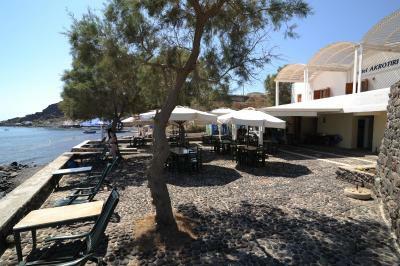 The area is relatively quiet (for Santorini), but is well serviced by excellent restaurants/tavernas at the waters edge. Mathios, the owner is always available and very helpful. 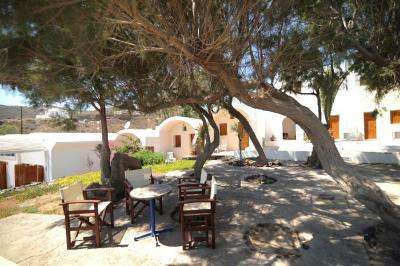 Peaceful, relaxing,sea view, breakfast, proximity to archaeological site, helpful and personable management. The service was absolutely incredible and everyone was extremely friendly. I enjoyed everything about this hotel! 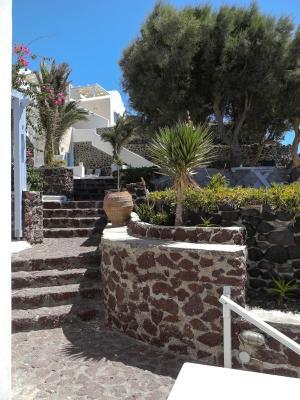 Hotel Akrotiri is enjoying a prime waterfront location in Akrotiri beach, near Santorini’s famous Red Beach and the archeological site. 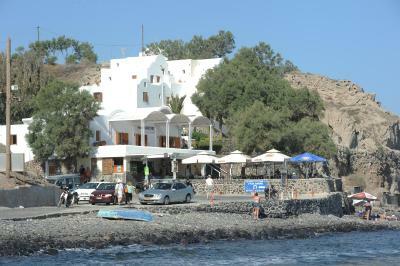 Hotel Akrotiri offers car rental services and arranges excursions and tours. All guests may benefit from the free of charge wireless internet connection in public areas. 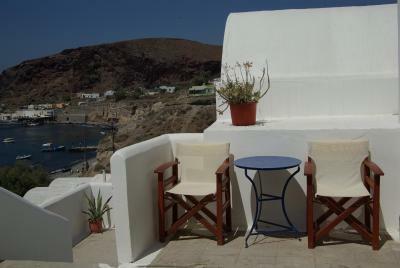 Air-conditioned room with balcony overlooking the Aegean Sea. Has a TV, fridge and safe. What I didn't like is in fact the feature that makes the hotel unique, there are 78 steps from our room to road level. Still, we had a great view from the room and the large well equipped terrace, and the effort of the climb was always rewarded. The mattress seems to be ageing and was somewhat uncomfortable, but not so much that we mentioned it to Mathios. Shower and wet floor after, uncomfortable (it’s can be dangerous too). Old bed equipment, on the top. No fresh air in the room, it’s sad cos it’s a seafront house. Thank you for all good things you have I love my stay! Our room was on the top of the hill. And Wi-Fi connection had some problems. The bathroom was a little old. Owner was ok, but we hardly saw them. Breakfast could have been better. The place was very nice. Breakfast was ok, but the really good things were brought downstairs to the bar where you had to buy them, that was a little awkward. 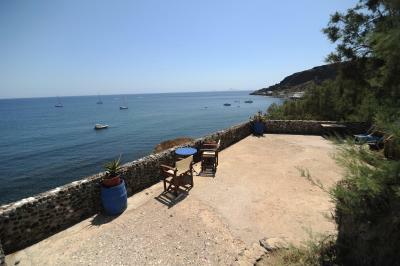 Great view and lovely terrace near the sea. Few minutes to Akrotiri museum but the city centre is a little far away and better to reach by car because the street is not so great for a walk. 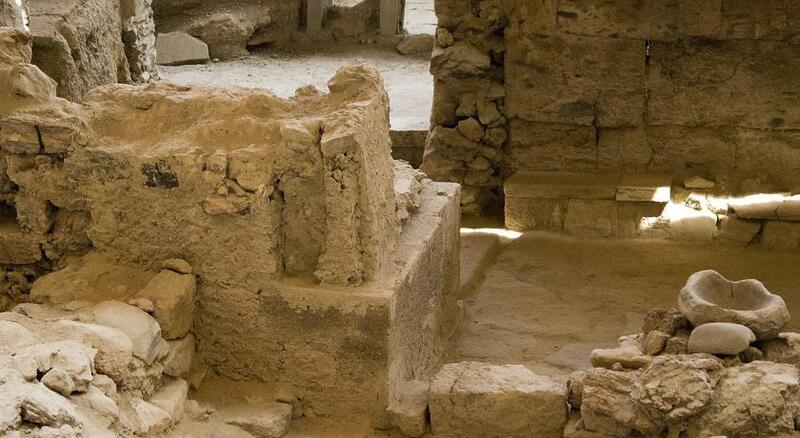 Akrotiri centre is beautiful! Parking spot (because red beach and Akrotiri historical site is nearby in afternoon you wont find parking spots, toilet curtain were so small and after every shower water was on floor and as they were flourished with tiles we have to be extra careful. My suggestion is bring more fruit items into breakfast. 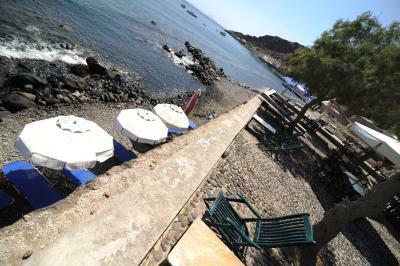 Location, has its own beach with free sunbeds and umbrellas and 15 mins walk to famous Red Beach. Host/Owner Mathios is a gentleman, He waited for us until 23:30 as our flight was delayed 1 hour and next day He gave me brief historical information about Santorini and places to visit during my 4 day stay, Bed was super comfortable but Only double bed not queen or king as I’m tall I was touching both sides of the bed. 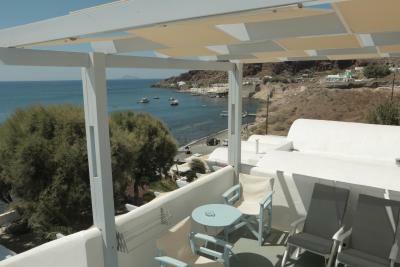 We were looked after very well and rooftop room was provided to us with a very good view every morning. Iron and iron stand was provided upon request. Continental Breakfast was very good and their were varitions of eggs every day (fried, omelette, scrambled and boiled). I can’t say anything bad about this hotel because I thought everything was perfect. 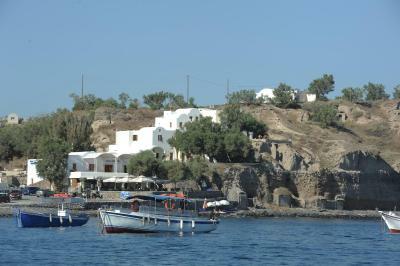 Akrotiri is a great part of the island- it is much more quiet and tranquil than Fira or Oia. It was great to have the sea right outside our balcony. Great breakfast and wonderful staff! The manager was very helpful and friendly. 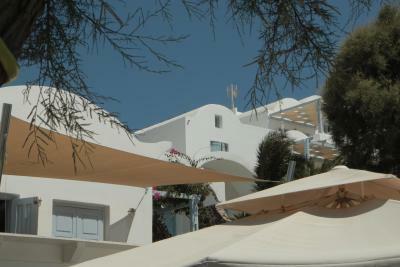 It was nice to stay somewhere in Santorini that has not been spoiled like a lot of other areas on the island. Lovely big room with great views, good breakfast. 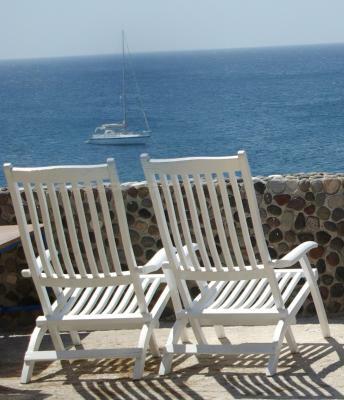 We were given a spacious studio with privacy and the best sea views from the hotel (room 19). The bathroom was new. Breakfast was included in the price of the room and it was varied, including local produce. The owner was very friendly and extremely helpful. The room was cleaned everyday. 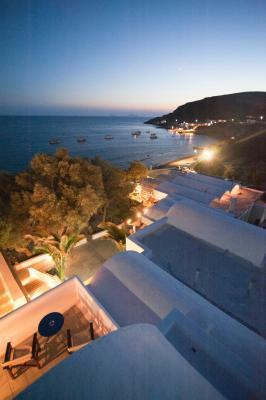 Hotel was situated on the seafront and it was close to award winning restaurants. Great place to stay if you want to be away from hustle and bustle. The only downside was the shower which was tricky to use without flooding the bathroom - but it worked fine and the place is so beautiful and such good value for money we didn’t care! 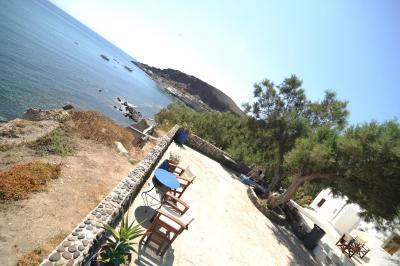 Amazing location, quiet and beautiful but easy reach of other places and attractions. Mathios and his staff were super. Very clean and simple room with outdoor sitting area and right in front of the sea. Amazing place. Amazing view. Amazing staff. Great everything !!! !